Treasure, World & U.S. Coin Auction #24: November 1-3, 2018. Daniel Frank Sedwick, LLC. Register Today! Looking to consign? Contact us today! 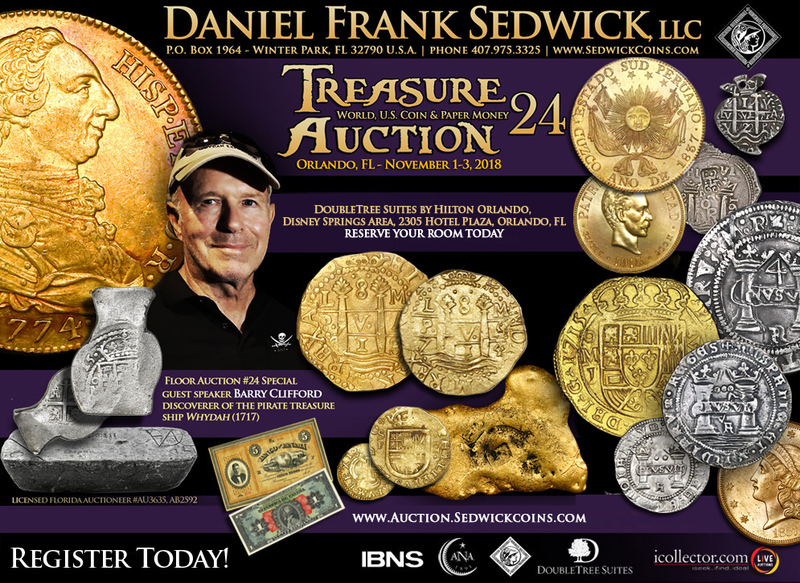 Email us at office@sedwickcoins.com or call our office at 407.975.3325. Emilio M. Ortiz, professional numismatist, researcher and author. The special room rate will be available until October 9th or until the group block is sold out, whichever comes first. Booking a reservation is simple: Just click here to receive our preferred group rate: "Book a Room"
�Hablamos su idioma! Our multilingual staff deals with the most important Latin American bidders and buyers on the market. We are able to travel and talk to all our Hispanic bidders and consignors, which creates a level of comfort that draws even the most private participants to our venue. Our auctions are known worldwide as the best place to buy and sell the kinds of coins and artifacts you love to collect or sell! 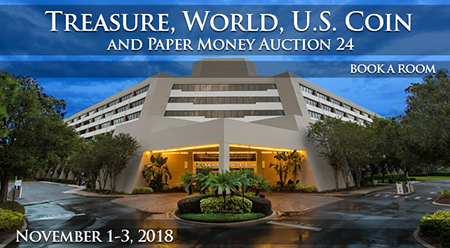 We look forward to hearing from you soon to help you with your collecting or selling needs, and we hope to see you at one of our upcoming shows AND in Orlando in November for our live floor auction. We encourage bidders to examine lots in advance in person, either at the coin shows we attend or at our premises in Winter Park, Florida (by appointment only), or at the auction site (when applicable). If you need better photos or special inspection of a lot please contact us, do not assume anything by a digital photo, thanks.